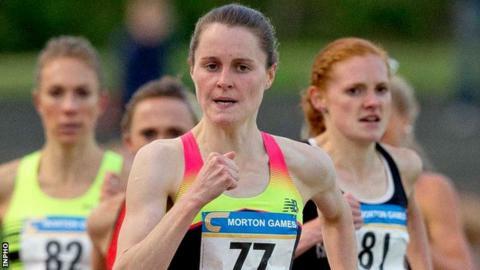 Ciara Mageean was fractionally outside the Olympic 1500m standard for the second time in five days at a meeting in Italy on Sunday. Mageean cut .05 off her Northern Ireland record that she set in Rovereto on Tuesday as she clocked 4:06.49. Ethiopian Gudaf Tsegay took victory in 4:05.17 ahead of Canadian Fiona Benson who clocked 4:05.24. The Canadian pushed Mageean, 23, into second place in Tuesday's race in Rovereto. Ethiopian-born athletes Mimi Belete and Axumawit Embaye also finished ahead of Mageean in Sunday's race while recent Kenyan World Championships representative Viola Lagat was behind the Northern Irish woman in sixth. Mageean opted not to compete at the recent World Championships in Beijing as she continued her comeback following an injury-affected couple of years. The County Down athlete won a superb world junior 1500m silver medal in 2010 but her hopes of competing at the London Olympics in 2012 were ended by a foot injury. An injury in her other foot caused her to miss this year's European Indoor Championships in March and she was only able to return to major competition in the latter part of the current outdoor season. However, her form over the last two months suggests that she is on course to qualify for the Olympics in Brazil.